Next Saturday (24th September, 10am onwards) the Lydiate scouts are assisting us by taking part in a sponsored litter pick on the Maghull/Lydiate area of Trans Pennine Trail/NCN 62. Whilst they are litter picking in the area, I am planning to continue to clear The Meadow site in preparation for wildflower seeding. 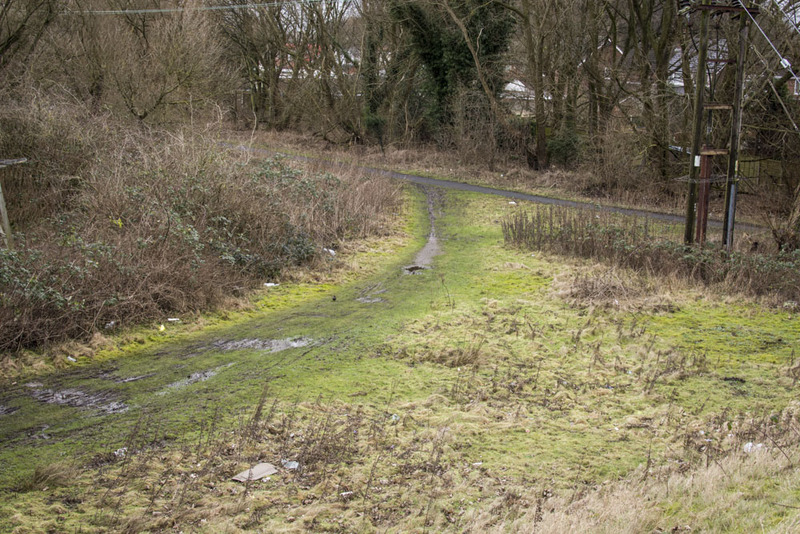 The Meadow site is at the beginning of the Cheshire Lines in Maghull, just off Sefton Drive, next to Sefton Meadows Garden Centre and the recycling centre. If any of you are available, I could really do with some assistance in raking the cut vegetation and clearing the ground. If you have not visited the site, It would also be an opportunity for me to introduce and discuss the Meadow project. I can also explain the bigger plan with this project and its impact for our area and all areas of the Trail. If you are available, it would be great to see you there. I have limited tools at this point and if you are able to bring a rake, it would be a great help. I also suggest you wear appropriate clothing for this type of task as the majority of what is being cleared is brambles and nettles. Please provide your own refreshments... although there is a cafe available at the Sefton Meadows Garden Centre. If you have not visited the site, It would also be an opportunity for me to introduce and discuss the Meadow project. I can also explain the bigger plan with this project and its impact for our area and all areas of the Trail. If you are available, it would be great to see you there. Also, I have limited tools at this point and if you are able to bring a rake, it would be a great help. I also suggest you wear appropriate clothing for this type of task as the majority of what is being cleared is brambles and nettles. If you could provide your own refreshments... although there is a cafe available at the Sefton Meadows Garden Centre. If you are able to assist could you let me know jc@photoreal.co.uk ...If you are unable to assist, but just want to come and say hello, you are more than welcome. Are you interested in some or all of the following...Cycling, walking, horse riding, sustainable transport, the environment, our local area, local issues, welcoming visitors to the area, access, maps, health, team work, social gatherings, open spaces, air quality, efficient walking and cycle routes, biodiversity, community and getting involved? If the answer is yes... then we would love to hear from you. We are volunteers for Sustrans and the Trans Pennine Trail for the Merseyside North area. Merseyside North area extends from the Sefton Coast between Aintree, Southport and inland beyond Ormskirk. Sustrans is the leading charity enabling people to choose healthier, cleaner and cheaper journeys. 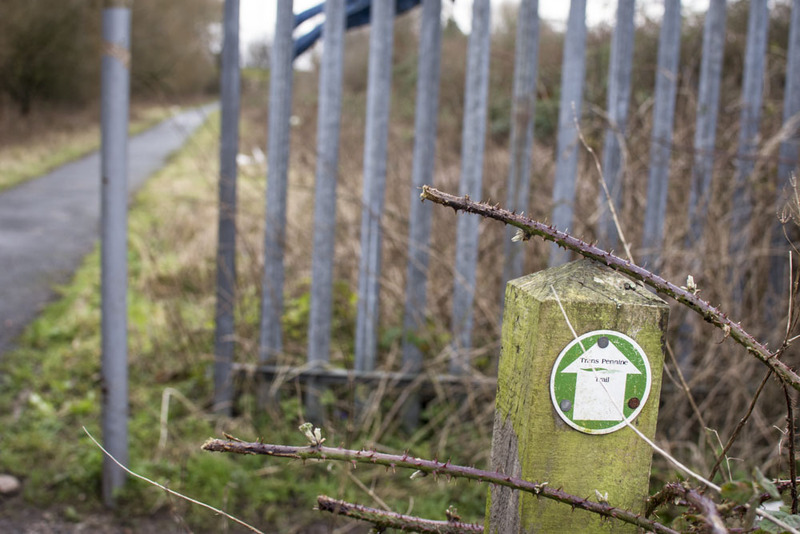 As volunteers, we are the eyes and ears on the ground and assist in maintaining the national cycle network, local connecting routes and raise peoples awareness to the choices available for the journeys they make. 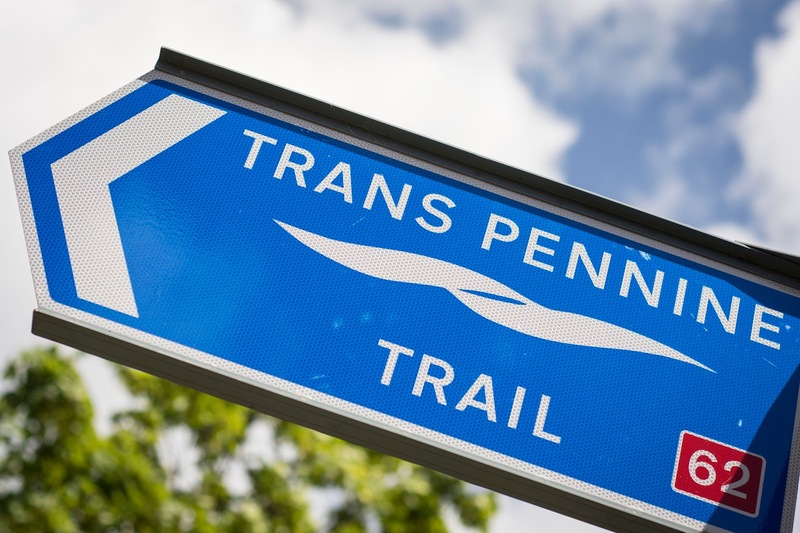 In the Merseyside North area at Southport we are also honoured to have the Beginning/End point of the Trans Pennine Trail. 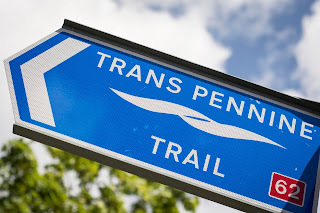 The Trans Pennine Trail is an internationally recognised and exciting route for walkers, cyclists and horse riders linking the North and Irish Seas, passing through the Pennines, alongside rivers and canals and through some of the most historic towns and cities in the North of England. 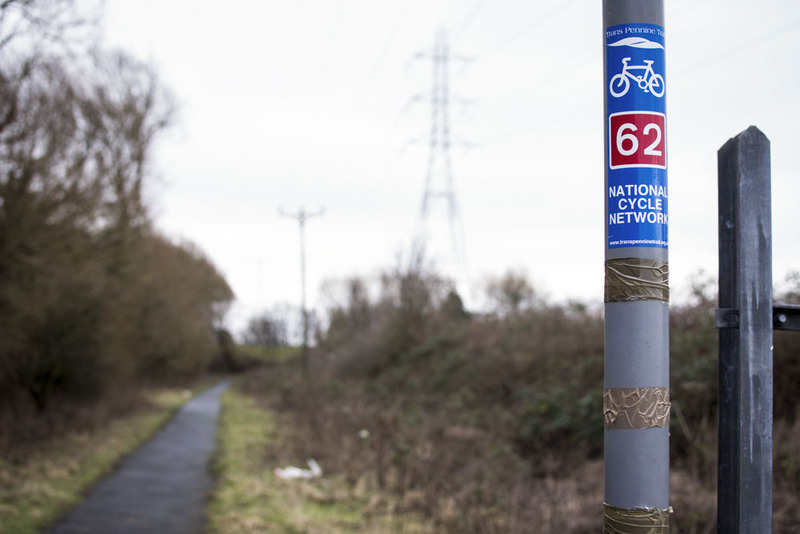 National cycle route 62 which runs through our area of Merseyside North is part of The Trans Pennine Trail. 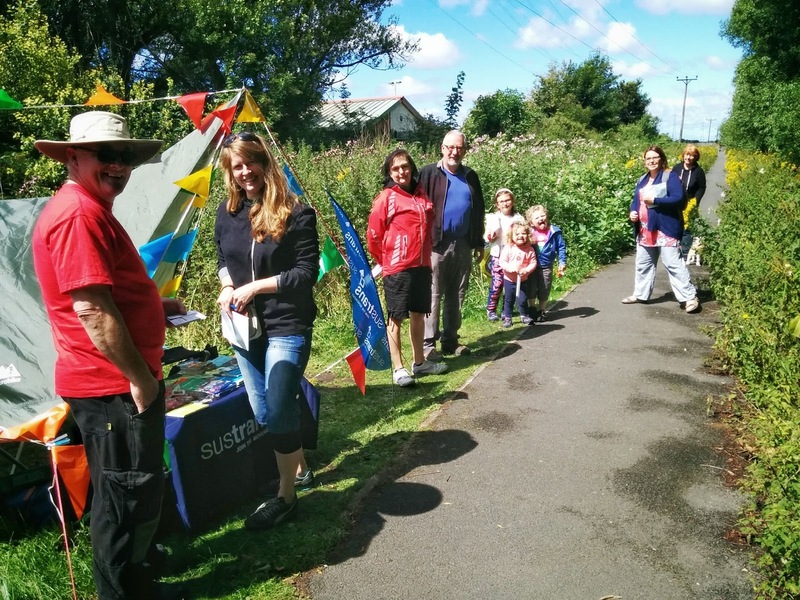 Being a volunteer with Sustrans and the Trans Pennine Trail can entail as much or as little involvement as you wish. 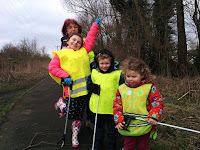 It doesn't necessarily mean you have to attend every event or activity, It means that if you enjoy and care about our area, are a cyclist, walker or someone who uses the cycle network and connecting paths then there is a part that you can play. We work with in close communication with local authorities and as a network can share information and assist in monitoring, maintaining and developing the amazing resources we have in our area of Merseyside North. There is also often the opportunity to develop new skills and obtain training. 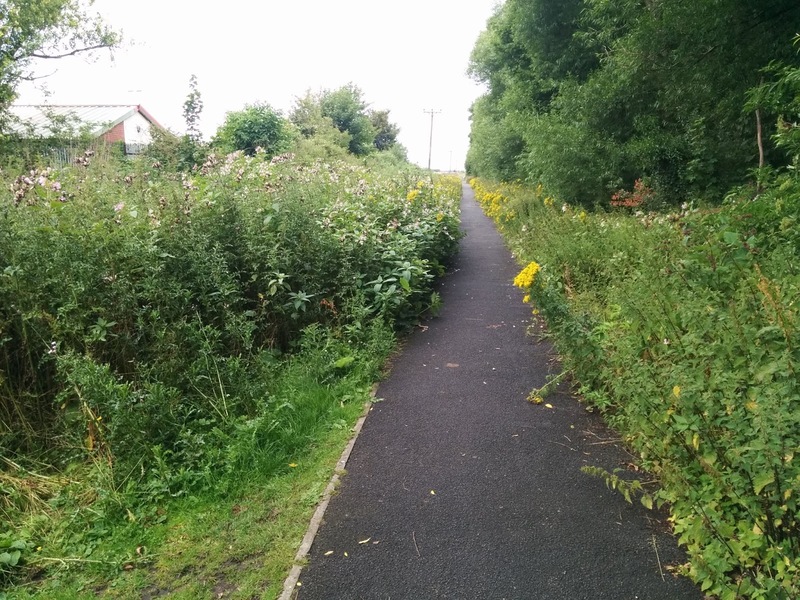 As mentioned in previous posts on this site, Merseyside North Volunteers have recently been awarded a £12,000 grant to develop a wildflower meadow, community space and encourage wildlife to an area of land on the Cheshire Lines area of the Trans Pennine Trail in Maghull, Sefton. Activities are about to start in clearing and developing this project. Again there are many areas of the project that volunteers can be involved in and it would be great to have your support. If you are interested in volunteering, would like to discuss any involvement or have a question... please do not hesitate to contact me, it would be great to hear from you. For more information on becoming a volunteer CLICK HERE TO EMAIL. 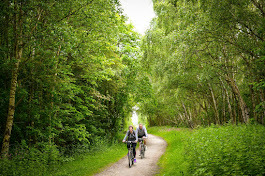 or visit the SUSTRANS or TRANS PENNINE TRAIL website. 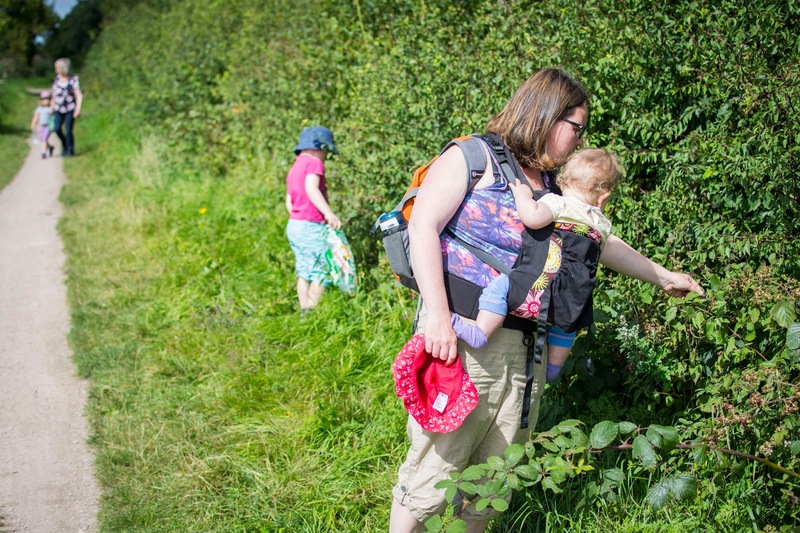 Exploring and Blackberry picking on the Cheshire Lines of the Trans Pennine Trail, NCN route 62, Lydiate - Sefton. Volunteer activity in the Merseyside North Area. We are delighted to announce we have bagged £12,000 from the Tesco Bags of Help initiative. The supermarket teamed up with Groundwork to launch its Bags of Help initiative, which saw grants of £12,000, £10,000 and £8,000 – all raised from the 5p bag levy – being awarded to environmental and greenspace projects. Eight million shoppers voted in stores up and down the country. And it can now be revealed Merseyside North Volunteers has been awarded £12,000. The results have been announced and we will now begin work on bringing our project to life. Merseyside North Volunteers are developing an area of Sustrans owned land to the rear of Sefton Drive in Maghull for the benefit of the community. This area of land is part of the National Cycle Network that forms route 62 and the Trans Pennine Trail. They bringing together their current volunteers and the local community of all ages and abilities to assist in removing overgrown vegetation, cultivate and develop the area of land into a wildflower meadow with the particular benefit to the bee and butterfly population that is in decline. They would also like to encourage other forms of wildlife by installing bat and bird boxes, hedgehog houses and insect hotels. For the local community this area will be an area where they can visit for pleasure and leisure whilst walking or cycling. For those from the wider community it will also be a resting or turning point on the very popular NCN route 62 of the Trans Pennine Trail. Permanent furniture will be provided for the community and those on their travels to rest a while, storage for the tools and equipment and hospitality facilities to increase the comfort of the community, visitors and volunteers. "We want to say a massive thank you for all the support that has been given over the last few weeks. It's a major boost to our volunteers to be voted for the top award in our area of £12,000. We have brought together 'The Meadow' project to create a community space where you can visit, sit and relax whilst enjoying the wildflowers and wildlife that are rich and diverse in our area. 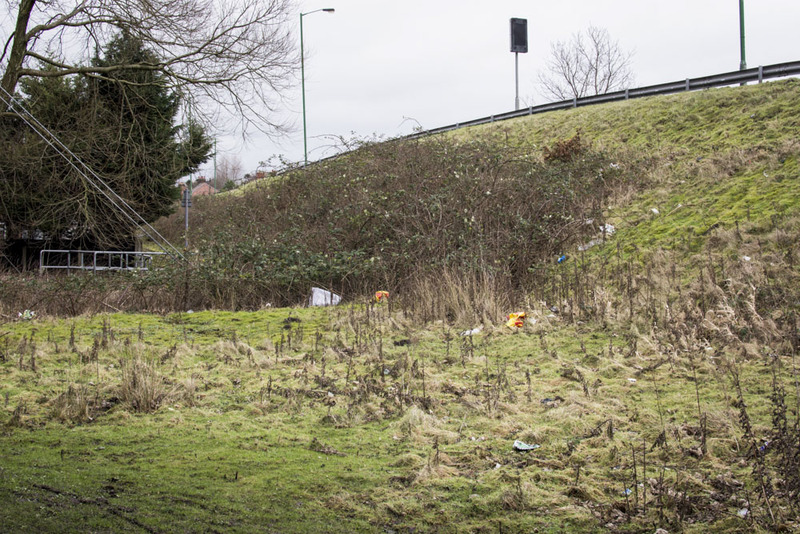 The area of land is close to Maghull, next to Sefton Meadows Garden Centre and the Recycling Centre and located on the popular cycle route called 'The Cheshire Lines'. This is also part of the longer distance Trans Pennine Trail. I hope through this project to deliver a space and environment back to you and the volunteers. 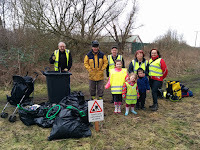 Perhaps you will even be inspired to visit 'The Meadow' during a ramble of cycle ride"
"We are currently a small group of volunteers that assist in maintaining areas of our local environment that form part of the national cycle network. The Meadow project is a major step to assisting us with our work that we are passionate about and committed to. We really want you, the community to be involved. 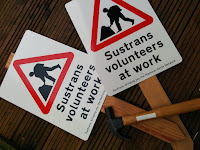 I would also like to encourage you to volunteer with us as part of Sustrans and the Trans Pennine Trail. If this is something that is of interest or you or would like more information, please don't hesitate to contact me." Caroline Silke, Head of Community at Tesco, said: “Bags of Help has been a fantastic success. Nominations and applications for the next round of Bags of Help funding will open on April 18. As well as applying direct, suggestions for projects can also be nominated by people living locally. Merseyside North Volunteer Coordinator for Sustrans and The Trans Pennine Trail. As we have announced in previous posts on Merseysidenorth.uk, we are recipients of Tesco's 'Bags of Help' grant. Today Friday 19th of February we ventured out to the site of 'The Meadow' to begin tidying. There is plenty of work to be done on the site and it was excellent to get started. It's amazing how much interest and support you can gather from, what is a basic activity... litter picking! It's also satisfying to know that through this action you are also benefiting the habitat for the wildlife of the area. We did mange to accumulate approximately 10 bags of rubbish and a wheelie bin full of two prams, a fire extinguisher, parts of a hoover and solid bag of cement.... 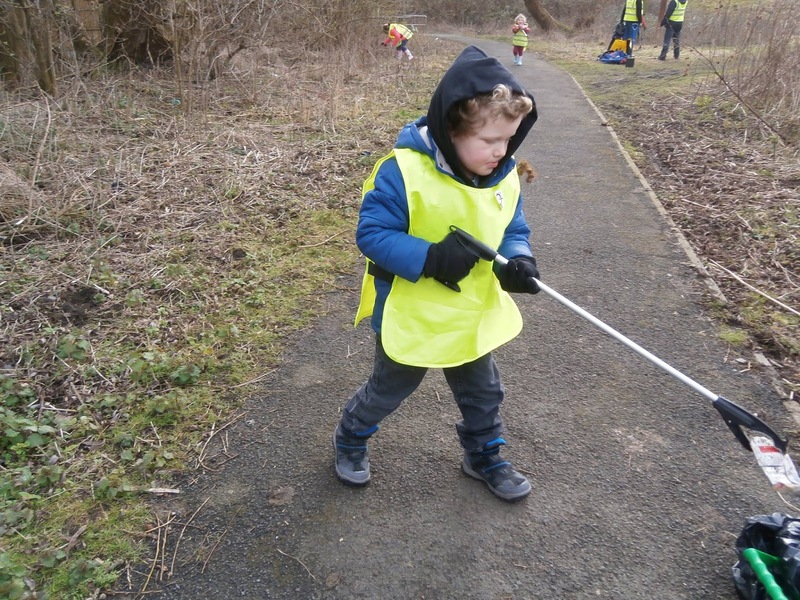 I think we made an impact with our litter pick so many, many thanks to all of those who took part. 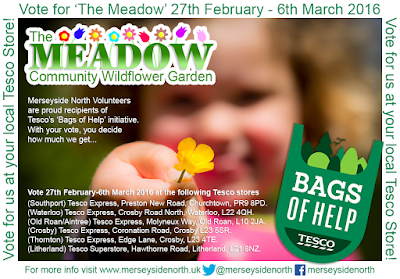 We can now confirm the following locations where you can vote for Merseyside North and 'The Meadow' project between the 27th February and 6th of March. (Southport) Tesco Express, Preston New Road, Churchtown, Southport, Lancashire, PR9 8PD. (Waterloo) Tesco Express, Crosby Road North, Waterloo, Liverpool, L22 4QH. (Old Roan/Aintree) Tesco Express, Molyneux Way, Old Roan, L10 2JA. (Crosby) Tesco Express, Coronation Road, Crosby L23 5SR. (Thornton) Tesco Express, Edge Lane, Crosby, L23 4TE. (Litherland) Tesco Superstore, Hawthorne Road, Litherland, L21 8NZ. Thanks for all you support!!! Bags of Help offers community groups and projects in each of Tesco’s 390 regions across the UK a share of revenue generated from the five pence charge levied on single-use carrier bags. The public will now vote in store from 27 February until 6 March on who should receive the £12,000, £10,000 and £8,000 awards. The Meadow... We need your votes on the 27th of February 2016! We are proud to announce that our volunteer group and you as the local community of Merseyside North are recipients of Tesco's 'Bags of Help' initiative (#BagsofHelp). We are asking you to visit your local Tesco store between the 27th of February and the 6th of March 2016 and vote for our project 'The Meadow'. Your vote could help us obtain £10000 or possibly £12000 to help us make a real difference in your community. We are proposing to develop an area of Sustrans owned land to the rear of Sefton Drive in Maghull for the benefit of the community. 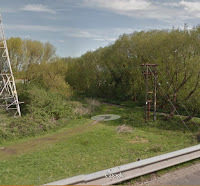 This area of land is part of the National Cycle Network that forms route 62 and the Trans Pennine Trail. We would like to bring together our current volunteers and the local community of all ages and abilities to assist in removing overgrown vegetation, cultivate and develop the area of land into a wildflower meadow with the particular benefit to the bee and butterfly population that is in decline. We would also like to encourage other forms of wildlife by installing bat and bird boxes, hedgehog houses and insect hotels. For the local community we want this to be an area where they can visit for pleasure and leisure whilst walking or cycling. 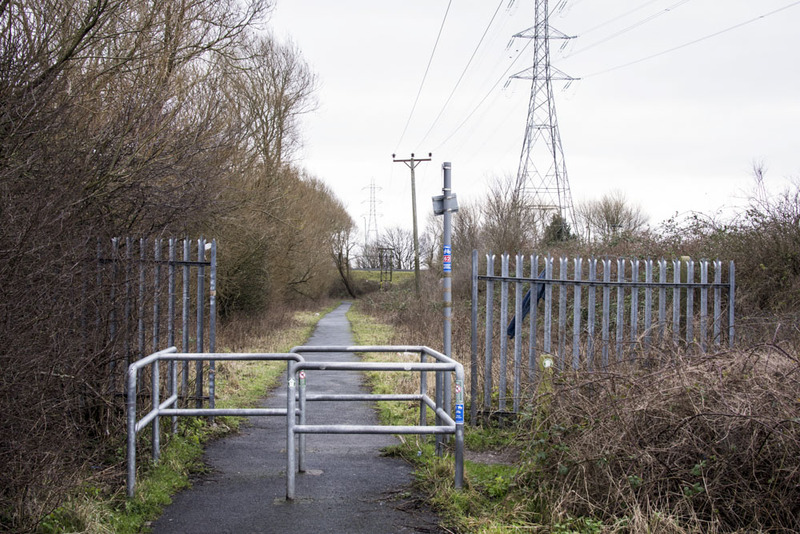 For those from the wider community we would like this to be a resting or turning point on the very popular NCN route 62 of the Trans Pennine Trail. 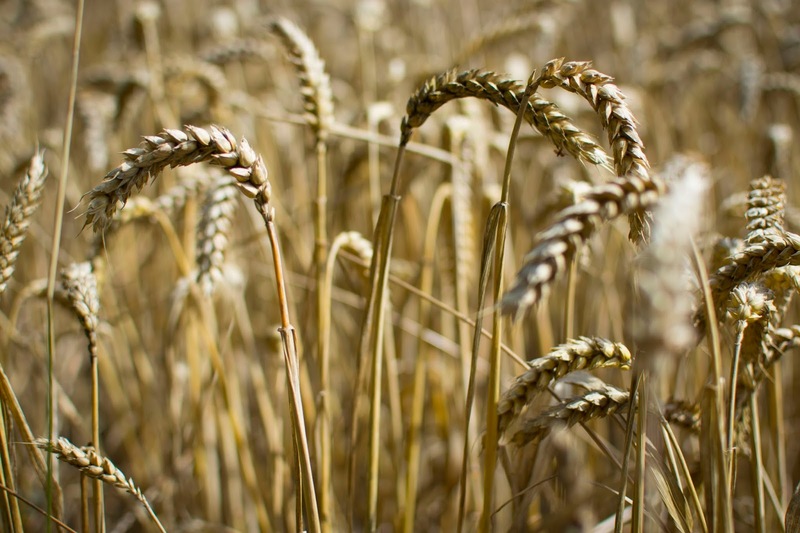 £8000 would give us the tools, equipment, resources and seeds to clear the land, prepare and cultivate the area. £12000 would give us the means to sustain the project beyond this initial phase to be productive and self sufficient. We would provide permanent furniture for the community and those on their travels to rest a while, storage for the tools and equipment and hospitality facilities to increase the comfort of our community, visitors and volunteers. 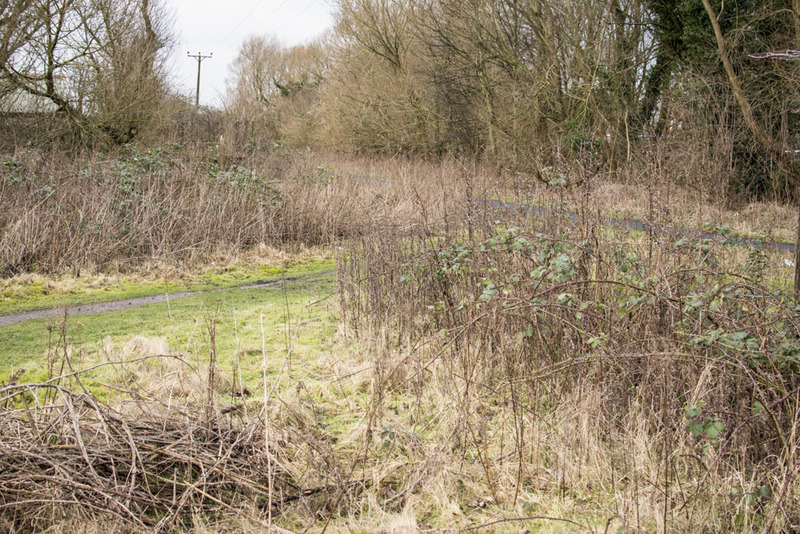 Currently the proposed project area of land approximately 150x30m is featureless, misused and overgrown with brambles and weeds with little flora value. 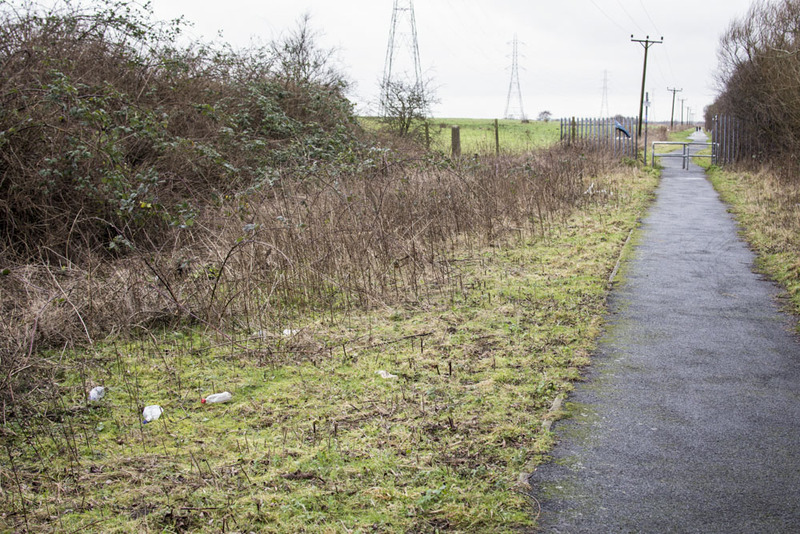 There is a tarmac path (NCN 62) running through the land which is often subject to littering and dog fouling. The area of land does have the benefit of control gates in order to stop motorised vehicles and some well established trees between the houses and the path. The project also has the potential to draw in wildlife and species from neighboring land to create a green, bio-diverse corridor. 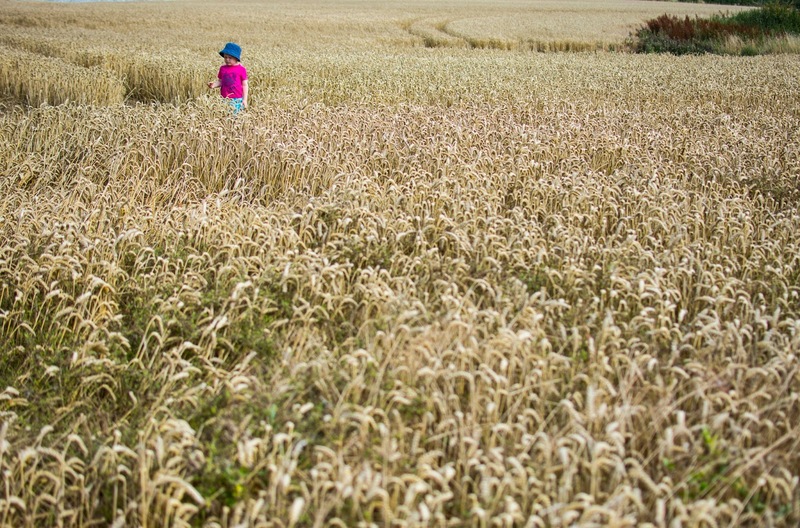 The area of land is accessible 24/7, 365 days of the year. We know the project is achievable, we just need the support of your votes in Tesco stores on the 27th of February 2016 to make the funds happen. at your local Tesco store!